A light-hearted but inspirational memoir about a remarkable couple who left behind the corporate rat-race to follow their dream of sailing around the world - a story that demonstrates the rewards of taking risks to follow one's star. When Nancy Knudsen and her architect husband Ted Nobbs decide to escape their high-pressure corporate lives and follow a dream of sailing around the world together, little do they guess where their journey will lead them. In 2003, Nancy Knudsen and her husband Ted decided to leave their stress-filled, time-poor corporate lives to spend three years sailing around the world. What they thought would be a breeze turned out to be hugely challenging as well as life-transforming. Nancy and Ted crossed the Indian, Atlantic and Pacific Oceans and visited 42 countries. During their voyage they faced life-threatening dangers and made lifelong friendships. And a surprise encounter in Turkey led them to set up home in Istanbul for two wonderful years. Their adventures are sometimes hilarious, sometimes life-threatening, and lead to the beginning of many life-long friendships. As well as recounting the comedy of their cockpit disputes and the sheer breathtaking beauty of their five-year adventure, Shooting Stars and Flying Fish has deeper resonances : it shows how the couple's experiences both humble them and irrevocably change their attitudes, ethics and outlook on life, with neither returning to the corporate world on their return to Australia. This book is a beautifully written, inspirational memoir that shows the rewards of taking a risk to follow one's dreams. ABC audio file : "Whatever happened to Nancy Knudsen?" How does a country go about changing its time zone ? Samoa plans to move itself from one side of the international dateline to the other, redrawing this already wobbly line. On Samoa's side of this imaginary line that runs from pole to pole, it is Tuesday. On the other side, it is already Wednesday. And this makes it tricky to communicate with its key neighbours Australia and New Zealand, a day ahead on the other side. So Samoa plans to reset its clocks and calendars when it shifts the dateline - probably on Thursday 29 December, Prime Minister Tuilaepa Sailele Malielegaoi said. Samoa will lose a day as it jumps straight from Thursday to Saturday. Any residents with a birthday on Friday 30 December will have to celebrate a day early, or a day late, as that date will not exist in their country. "There is no body that can say yes or no," says David Mumford, of Collins Bartholomew, which publishes the Collins and Times atlases for HarperCollins. "The country decides for itself. Then it's just a matter of publicising it, informing the international community and the map-makers." "There have been various deviations and enclaves over the years, so we need to keep an eye out for proposed time zone changes. Once these go ahead, we update our atlases," says Mr Mumford. The dateline, and standard time zones in convenient hourly chunks, dates from 1884's International Meridian Conference. It agreed upon a 24-hour clock for the world, with days starting at midnight at longitude 0º - a prize awarded to Greenwich, in London. This meant longitude 180º - the imaginary dateline which separates two consecutive calendar days - would run through the Pacific Ocean. It zigs and zags as it crosses land or passes through island groups. It kinks east to encompass Siberia within the same date as the rest of Russia, and west to bring Hawaii into line with the rest of the US. In 2007, Venezuela's president Hugo Chavez shifted the entire country back 30 minutes. And France used to be on Paris time, which is only nine minutes ahead of GMT. But the country is now GMT+1. "A switch can make historical records confusing, and may cause headaches for legal cases, but most people won't notice," says Ms Higgitt. Swapping sides of the dateline is not a first for Samoa. It, and neighbouring American Samoa, lay west of the dateline until 1892, when a US businessman convinced both to switch to the east for trading purposes. So on New Year's Day 1995, it declared that it was adding a huge eastward bulge to its section of the dateline so all 33 of its islands would have the same date. "It was an administrative convenience," says Michael Walsh, the Kiribati Honorary Consul to the UK. "There were nine islands on the other [eastern] side of the international date line, and 20% of the population. An unintentional byproduct of this was that when the millennium came, we were the first to see the sun." There were not so many practical problems with this move, he says. The eastern-most islands were uninhabited, with no infrastructure. "We just did it and told the world. Some atlases took a while to adjust." Kiribati's decision did prove somewhat controversial, says Roger Pountain, of Collins Bartholomew, as some believe that the dateline is a global standard, and is therefore a matter for the international community to decide. 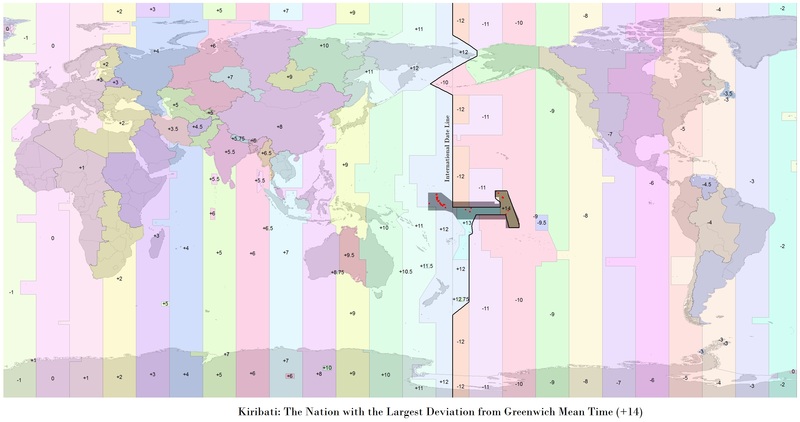 "It is still the case that some cartographers, website owners, and even public authorities continue to prefer to show the dateline as not diverted round Kiribati, while also acknowledging that Kiribati's time zone conflicts with that," says Pountain. From A History of the International Date Line : A similar adjustment of the date line occurred in 1892 when king Malietoa Laupepa of Samoa was persuaded by a major American business house trading in that region to adopt the American day reckoning instead of the Asian day reckoning. In a fine stroke of diplomatic flattery this was put into effect by ordaining that the 4th of July in that year would be celebrated twice. 24timezone : What Time Is It Around The World Right Now? But all these hardware interface use some manual configuration (web configuration via some Ethernet or Telnet/https/SSH interface, via specific utilities not cross-platform -Windows only-, via console), so no user-friendly way to connect your marine instruments directly to the iPad. To allow the interface between a marine sensor and the iPad without any manual operator intervention, the Marine GeoGarage team has lead an experimentation using Zeroconf networking, which enables automatic discovery of devices on the iPad. For that, we use a basic SoC (System on a Chip) AR2315 Atheros based Wi-Fi router (also used in the Marine GeoGarage AIS experimentation). developing an embedded software (under OpenWRT) to broadcast the received NMEA sentences to a specific iPad application implementing zeroconf protocole. Sea surface salinity has a massive influence on Earth's climate. With Aquarius, scientists will have a new way to measure that influence in a consistent way. With its unprecedented accurate and consistent salinity measurements, Aquarius will help climate modelers to better understand the ocean-atmosphere processes that are changing Earth's climate. When NASA's salt-seeking Aquarius instrument ascends to the heavens this June, the moon above its launch site at California's Vandenberg Air Force Base won't be in the seventh house, and Jupiter's latest alignment with Mars will be weeks in the past, in contrast to the lyrics of the song from the popular Broadway musical "Hair." Yet for the science team eagerly awaiting Aquarius' ocean surface salinity data, the dawning of NASA's "Age of Aquarius" promises revelations on how salinity is linked to Earth's water cycle, ocean circulation and climate. Salinity – the concentration of salt – on the ocean surface is a key missing puzzle piece in satellite studies of Earth that will improve our understanding of how the ocean and atmosphere are coupled and work in tandem to affect our climate. While satellites already measure sea surface temperature and winds, rainfall, water vapor, sea level, and ocean color, measurements of ocean surface salinity have, until quite recently, been limited to sparse data collected from ships, buoys and a small number of airborne science campaigns. From those limited data, we know ocean surface salinity varies by only about five parts per thousand globally. Yet a change of just a fraction of one part per thousand can influence the circulation of the ocean. Knowing the salinity of the ocean surface can also help scientists trace Earth's water cycle – the process that circulates freshwater from the ocean to the atmosphere to the land and back again to the ocean through rainfall, evaporation, ice melt and river runoff. Aquarius, the primary science instrument on the Aquarius/Satélite de Aplicaciones Científicas (SAC)-D spacecraft built by Argentina's national space agency, Comision Nacional de Actividades Espaciales, will help scientists study these complex, interrelated processes and their link to climate. Recent studies have shown Earth's water cycle is speeding up in response to climate change, which affects global precipitation patterns. Currently, scientists study the water cycle by making inferences from measurements of how much water is discharged from rivers and by measuring precipitation and evaporation rates using satellites like NASA's Tropical Rainfall Measuring Mission. "About 80 percent of Earth's water cycle takes place over the ocean," said Aquarius Principal Investigator Gary Lagerloef of Earth & Space Research, Seattle. " By measuring ocean surface salinity, Aquarius will be able to track how the water cycle is changing in response to climate change." While surface winds drive currents in the upper ocean, deep below the surface, it's a different story. There, ocean circulation is dominated by changes in the density of seawater. These changes are determined by salinity and temperature. The saltier and colder the water, the more dense it is. In parts of the world, cool, high-salinity surface waters become so dense that they sink to great depths, where they become part of deep ocean currents. Found in all ocean basins, these deep currents are interconnected and play an important role in regulating Earth's climate by transporting heat globally. By revealing changes in patterns of global precipitation and evaporation and showing how these changes may affect ocean circulation, Aquarius will help improve predictions of future climate trends and short-term climate events, such as El Niño and La Niña. Gautama Siddhartha, the founder of Buddhism, once said, "A spoon of salt in a glass of water makes the water undrinkable. A spoon of salt in a lake is almost unnoticed." Such is the challenge faced by the scientists who designed Aquarius. Since ocean surface salinity generally averages just 32 to 37 parts per thousand around the globe, it's very hard for a satellite to detect its signal. The salinity differences between El Niño and La Niña are very small – only about one part per thousand. Aquarius employs new technologies to be able to detect changes in ocean surface salinity as small as about two parts in 10,000, equivalent to about one-eighth of a teaspoon of salt in a gallon of water. Its unique, advanced design combines three radiometers, which measure the salinity signal, with a scatterometer that compensates for the effects of ocean surface "roughness" (waves). The result is expected to be the most accurate salinity data ever measured from space. Scientists will combine Aquarius' maps of global ocean surface salinity with in-ocean salinity measurements to generate routine maps of ocean salinity distribution. Later in the mission, Aquarius data will be inter-calibrated and combined with complementary data from the European Soil Moisture and Ocean Salinity satellite. Scientists believe Aquarius will lead to exciting and unexpected new discoveries — a "mind's true liberation" of sorts. They will be able to accurately calculate the rate at which surface ocean circulation transports freshwater. They'll see how salinity is affected by melting ice, freshwater flowing into the ocean, and fluxes of freshwater to and from the atmosphere from rainfall and evaporation. They'll be able to better study how ocean waters mix vertically. And they'll greatly reduce uncertainties in calculating the ocean's freshwater budget (the net difference between freshwater lost in the ocean through evaporation and freshwater added to the ocean by precipitation and runoff). Perhaps nowhere is the potential for discovery from Aquarius higher than in the Southern Ocean. 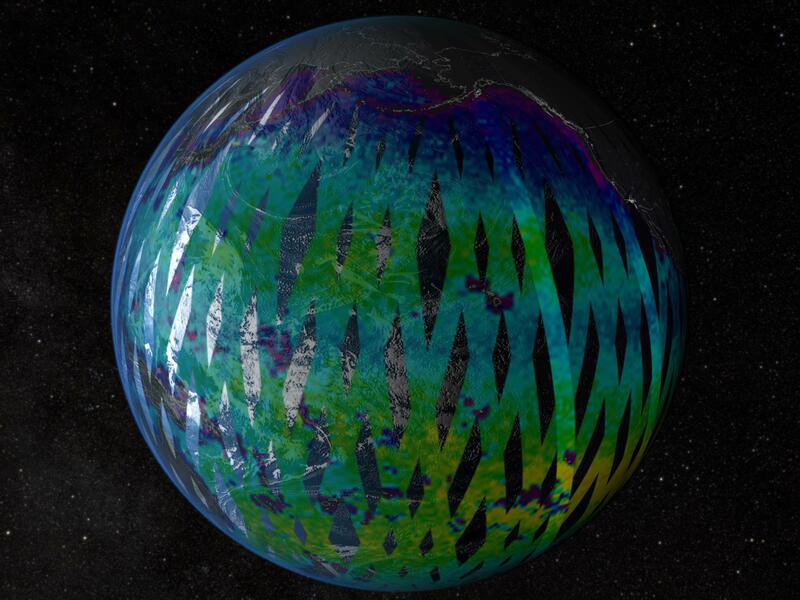 "Today's salinity maps don't show many features in the Southern Ocean," said Yi Chao, Aquarius project scientist at NASA's Jet Propulsion Laboratory, Pasadena, Calif., which jointly built Aquarius with NASA's Goddard Space Flight Center, Greenbelt, Md. "This is because data there are so sparse. Yet the Southern Ocean is one of the key deepwater formation areas in the world and is one of the key drivers of deep ocean circulation and heat transport." the Central North Atlantic, where salinity has been observed to be increasing, and the region has been getting more arid. the Nordic and Labrador Seas, where dense water forms at the surface and sinks to deep layers in the ocean. Aquarius should be able to observe the year-to-year effects of ice melting on the circulation between Greenland and Iceland. the Indian Ocean and Bay of Bengal, which have a very large salinity signal but have been less frequently measured than the Atlantic and Pacific oceans. And then there's the Arctic Ocean, which has seen significant changes in sea ice cover in recent years. Aquarius will provide some salinity measurements over the Arctic during its ice-free seasons, though the Aquarius signal is less sensitive over cold water. Simulated ocean salinity data for NASA's Aquarius instrument. Aquarius, launching this June aboard the international Aquarius/SAC-D observatory, will map the salinity of the surface of the global ice-free ocean every seven days for at least three years, providing data on a key missing variable in Earth satellite studies that links ocean circulation, the water cycle and climate. Aquarius' prime mission will last at least three years, long enough to map year-to-year variations in salinity that will allow researchers to develop the methodology for and demonstrate the usefulness of salinity as a climate data record. Aquarius data will eventually be used to improve the accuracy of climate forecast models. Ocean surface salinity is not currently well represented in models used by the United Nations' Intergovernmental Panel on Climate Change in its assessment reports. Lagerloef likened Aquarius to an explorer of an unexplored frontier. "We'll see the ocean in a whole different light. When the first Earth science satellites launched in the 1970s, we saw ocean eddies for the first time and got our first glimpse of the tremendous turbulence of the ocean. With Aquarius, we're going to see things we don't currently see. It's as though the blinders will be removed from our eyes." This video features the Grimpoteuthis bathynectes species. its ears are really fins that help it move through the water. A rarely seen white deep-sea octopus has been captured on camera in high definition by researchers from the University of Washington. The octopus features two “wings” which make it look just like the ghosts from Mario videogames, aka Boos. The Grimpoteuthis bathynectes octopus, also nicknamed the Dumbo octopus, was filmed with an HD video camera at a depth of more than 2,000 metres [6,500 feet] about 200 miles off the coast of Oregon in September 2005 as part of the VISIONS ‘05 expedition led by Professors John Delaney and Deborah Kelley of the University of Washington. Little is known about the deep-sea octopuses, which live near the hydrothermal vent fields — fissures in the Earth’s surface generally found near volcanically active places that release geothermally heated water- associated with the underwater volcanoes of the Juan de Fuca Ridge in the Northeast Pacific Ocean. The seabed off the Cornish coast seems to have almost recovered after an oil tanker spill in 1967, writes Paul Rose, expert diver and presenter on BBC programme Britain's Secret Seas. The Torrey Canyon is the largest shipwreck in British waters, and as she sits a long way from shore amongst the same hazardous rocks that she ran on to, its not the easiest wreck to get to. On Saturday, 18 March 1967, she ran aground carrying over 119,000 tonnes of crude oil, which gushed out into the pristine Atlantic waters. 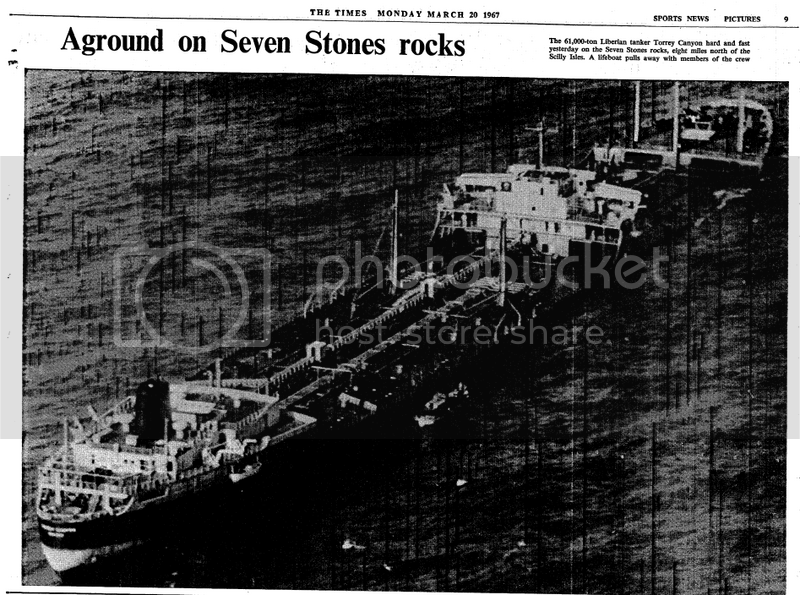 She had run into one of the infamous Seven Stones rock pinnacles, which lay 15 nautical miles west from Lands End and seven nautical miles from the Scilly Isles, which make it a hard wreck to reach. We believe our team is the first to film the wreck, which is in an area often hit by storms. As I rolled off the boat into heaving waters caused by constant huge Atlantic swells, I entered a great swaying underwater forest of kelp. The water was gin clear and the huge kelp fronds were in a mad rhythm of bending, then standing straight up, swinging and heaving to the forces of the sea. It was a great, vibrant start to the dive, but it looked to me as if we had missed the Torrey Canyon completely, as after all she is said to be well broken up over 2 sq km of the seabed. I then realised that I was on the wreck - the huge hull plates have so much life on them that they look just like rocks or the bottom. The sea has reclaimed the wreck and it is teeming with life. Things started to make sense and as I swam along the steel plates I joined large schools of wrasse, pollock and pouting. Some of the schools were moving purposefully along the wreck sides and others had relaxed into shoals underneath and inside the wreckage. I used the big surges to drive me forwards and then I held on during the backwash so I made good fast progress around piles of machinery, winches and twisted steel plates all completely camouflaged with weed, anemones, briozoans, starfish and colourful urchins. There was no single identifiable cause for the world's largest super tanker to run aground on the well-known and well-charted rocks. But at time of the disaster the skipper had plotted a shorter than normal route, in effect cutting a corner, and it was the ship's cook who was on watch in the bridge. There was widespread confusion about how to deal with massive spill. A decision was made at the time to bomb the wreck and its oil slick in an attempt to burn the oil. The Royal Navy were rallied and they led the bombing runs dropping 62,000lbs of bombs, 5,200 gallons of petrol, 11 high-powered rockets and an undisclosed amount of napalm on the wreck and the surrounding waters, sinking the ship, but not really dispersing the oil. On my dive, as I whizzed round the corner of the superstructure I hovered over one of the many bombs that had been dropped on her. I was relieved to see that it had exploded, but it was a healthy reminder that there are hundreds of unexploded bombs on and nearby the wreck. The 20-mile long oil slick reached the Cornish coast in a few days triggering a massive environmental catastrophe including the death of over 25,000 sea birds. The familiar golden sand beaches were totally black and no life existed on any of the sea cliffs. In spite of cleaning car tyres and workers boots, the heavy black crude made its way into the streets, shops and homes. The fumes could be smelt throughout Cornwall and with the bombers flying low making their runs to the wreck site one could be forgiven for thinking that a version of black hell had arrived. There was a dire need to "do something" and so a huge clean up operation began including widespread use of detergents. These were such aggressive chemicals that many of the beaches and cliff areas still show signs of their effects. Six months after the spill some untreated beaches had returned to a pristine condition, whilst the treated beaches had become a wasteland. Nineteen days after the wreck, its massive oil slick hit western Guernsey and in a reaction similar to the Cornish the authorities decided to act fast. Tourism was the island's main source of income - the beaches had to be saved. So in a desperate, fast and furious 11 days they managed to scour the beaches clean by collecting tonnes of the crude and dumping it into a disused quarry. The beaches were saved, but a visit the quarry is a sobering experience. Much of the oil has been removed and processed for use, but each time a large amount of oil is taken from the quarry, more seeps up from the sediment below and so the process has to start again. The quarry cannot be dredged to clean it because during WWII, the Germans who occupied the island used it as an armaments dump and tonnes of unexploded ordnance remain. In 2009 the water level rose and the change in pressure released yet more crude from the bottom. But there is hope - both for Guernsey and for future oil spill clean up campaigns. The Guernsey team are using a process called bio-remediation in the quarry, which uses naturally-occurring bacteria which eat oil as a food source. These micro-organisms are pumped into the oily water 24-hours a day and it is hoped that in a year all of the oil will have been eaten. Rarely has a TV campaign been won so convincingly. In January this year, Hugh Fearnley-Whittingstall's Fish Fight programme persuaded over 600,000 of us to support a ban on the wasteful practice of throwing dead fish back into the sea. The European commission listened and has announced it intends to ban discarding fish. For some peculiar reason, the fishing industry's reaction to the commission's announcement was not as warm as you might have expected. A discard ban will put many out of business, we now hear, presumably because many of the fish caught as bycatch are smaller and less valuable than the ones fishermen land today. So in announcing the plan, Maria Damanaki, the European fisheries commissioner, sought to soften the blow. Under her proposal, fishermen may be paid to fish for plastic instead. Plastic fisheries sound daft, but the idea is far from silly. Our seas are awash with plastic bottles, bags, nappies, discarded fishing nets, ropes and thousands of other bits and pieces – the flotsam of modern life. By 2008, the latest year for which I have a figure, 260m tonnes of plastics were made using 8% of global oil production in raw materials and energy. The curve of production over time bends upwards like a cliff face, increasing by 9% per year. The stark reality of this ever-steepening upward climb is that more plastic was made in the first 10 years of this century than all of the plastic ever created up to the year 2000. Deliberate dumping of plastic at sea has been banned since 1998, but the law is hard to police. The amount of rubbish picked from British beaches in cleanups sponsored by the Marine Conservation Society increased 77% between 1994 and 2009, much of it chucked from ships. Rivers add mindboggling amounts of plastic into the sea daily; much of it soon comes back to a coast near you. Every year, about 2,000 items of rubbish (most of it plastic) washes ashore for each kilometre of beach in Europe. The Mediterranean is worst affected with up to 18,000 pieces per kilometre per year, so it isn't surprising that the European commission plan to test their plastic fishing proposal there first. Even the deep sea is not beyond reach. About half of plastics sink, and submarine pilots regularly see bags float past 1,000 metres down. Plastic at sea isn't just unsightly. Many seabirds, turtles, fish and others mistake plastic for food: 19 out of every 20 fulmars that wash up dead onto European beaches have a belly full of plastic. Adult birds pick up floating plastics at sea and feed them to their chicks. If plastic was just harmless roughage it would be bad enough. Instead, many plastics come loaded with chemicals like flame retardants, which get passed up the food chain and so can come back to us in the fish we eat. Worse still, plastics accumulate toxic chemicals (such as pesticides found in water) and concentrate them to thousands of times background levels. Over the years, floating plastics break into ever smaller fragments, making it easier to transfer their chemical burden to anything that eats it. In some places, there is more plastic than plankton. Fishing for plastic is a great idea. It won't rid the sea of the microscopic soup already adrift, but it could stop things getting worse. There is already a voluntary scheme, Fishing for Litter, which provides collection facilities at ports where rubbish caught can be disposed of rather than thrown back over the side. All of Scotland's major ports already participate. Given that fishing nets sweep the majority of European waters every year, a dedicated cleanup could clear much of the accumulated trash within a few years. But ultimately, the plastic problem will only be solved if we all use less and make sure none of it reaches the sea. "10 things I have learned about the sea"
Lorenzo Fonda : "This video is based on footage I shot on marine vessel "Portland Senator" on the route from Los Angeles to Shanghai, in December 2008. Let it load. If you don't have patience or don't know me personally, you might not want to watch this."